Well now I’ve heard of everything. 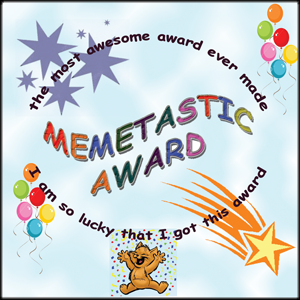 Shirley from gluten free easily just bestowed the Memetastic Award on me. This award is an irreverent, offbeat one. Right up my alley. The awardees must tell 5 things about themselves, with 4 out of 5 being outright lies. The awardees must also pass the award on to five others … okay, that part is pretty standard for blog awards. I’m thinking this will be fun to see who can figure out what is real and what is the lie. But before I get to that I need to pass this along to 5 people. I happily bestow the Memetastic Award on to Wendy, Tia, Carol, Lexie and Brittany mostly because I can’t wait to see what 5 things they share and try to figure out which one is actually true. 2. I love when it snows. 3. I’ve worked in the food industry in Pennsylvania, New York City, Boston, New Hampshire, West Virginia and Virginia. 5. I used to babysit the kids of Philadelphia 76ers basketball team star, Doug Collins. OK which one is true? You can jump to the creator of this award, Jillsmo at Yeah. Good Time and see who else has won. ← How Did I Get So Lucky! I shouldn't be up this late, but here I am Diane! The only one I know for sure is that #1 is a LIE. I'm guessing #4 but that seems too easy. Shirley this is the most fun award. Thank you for giving it to me and I was happy to pass it on. I'm with you I had a long list of people so I hope these 5 will do it and keep it going. #1 totally cracked me up, #3 makes the most sense, so it’s probably a distraction. So, after this LONG winter, I’m going with #2! Congrats on the fun, silly award. Heather I'm glad you liked the 5 statements. I'll share the answer at the end of the day. I'm going with #5 because it's random and specific. No idea though really! Oh this is more fun than I thought! I love you guys guessing. I promise I'll share tomorrow. I think Im going to go with Number 3..
And THANKS for awarding me 🙂 Hoping to find some time to do this..
Brittany it's one of the fastest posts I've written. Not sure what that says about me. I can't wait to see your list of 5. Only one is true? I'm going with #5 too…it's too random to be made up! Iris that was a good guess but not right. I will be doing my 5 from Shirley's award on Thursday….when I do your Gluten Free Diner Review and Giveaway (that I have been meaning to get up for a couple of weeks). Cannot wait to hear who is right! OK finally found your comment. It was hiding. I have to look in a couple of places from now on. Hmmmm. I agree with Alison that #1 is a lie, for sure. Puh-lease. I know people are saying #5 because it seems too specific, but I think that is to throw people off. I know you love Harry, but I am going to guess #4 because I have seen you go nuts with cookbooks for sale in front of you. And, I don't know if you are counting any weird, non-actual-novel Harry Potter books. You could have a million of those. But, I'm sticking with #4. Can't believe I just wrote out everything I was thinking. Wait, yes I can. I always do that. And, I won't let you down. I just need to think of some boring lies and fantastic true stuff. Thanks for thinking of me, Diane. Tia I can't wait to see what is on your list of 5. Sorry Katrina, this one is a big fat lie. Carol I can't wait to see your list of 5! I started with process of elimination. 1. I know that number one is a lie because you are one of the most passionate advocates of "Real" food and wouldn't ever up a box of Hamburger Helper, gluten free or not. 2. I think you've hinted or maybe outright stated that you'd like to live in California, so I'm guessing that number 2 is a lie. 3. Now it's getting harder. I know you've worked in the food industry, from reading your love story. So, this one could be true. But maybe not? Because while you've worked in the food industry, maybe you haven't done so in that many states. 4. This one had me thinking it could be the truth because I thought to myself – "even if she liked Harry Potter, how many Harry Potter books and stuff could she have?". And anyway, she loves to cook. But then I thought "maybe she REALLY loves Harry Potter and is a rabid collector of anything Harry Potter?!?". Oh dear. I haven't yet decided. 5. I ruled this one out. Not enough weightiness. Number 3 and 4 have it over number 5. Um. So it's either number 3 or 4. Um, um, Um, I'm going with number 4. Close Ellen but you should have gone with #3. Oh and one more thing…I am giving away a copie of your fab e-book as well! Thank you Carol! I hope you get lots of entries.